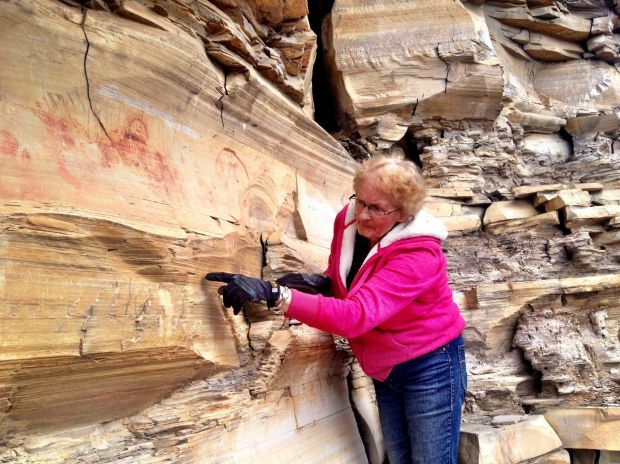 Macie Ahlgren points to pictographs on a rock wall that the family called Bear Gulch located on her family's ranch near Lewistown in central Montana in April 2014. The Bear Gulch site has somewhere between 4,000 and 5,000 individual pictographs and petroglyphs. It wasn't until the ranch had been in her family for 70 years that Ahlgren came to understand the full importance of the pictographs. LEWISTOWN — Growing up on a ranch outside Lewistown, Macie Ahlgren used to enjoy playing at a creek that ran through the ranch, near a rock wall. The area was lush and green, like her own personal park. Plus, the large rock wall was covered in paintings and etchings of human and animal figures, tepees and weapons. "Dad always said, 'You can go over there and play but leave them Indian signs alone,'" Ahlgren said. Ahlgren's family always respected the site, which they called Bear Gulch because Bear Creek ran along the base of the cliff. The family even offered tours to allow people to see the pictographs and petroglyphs, which are all on private land. 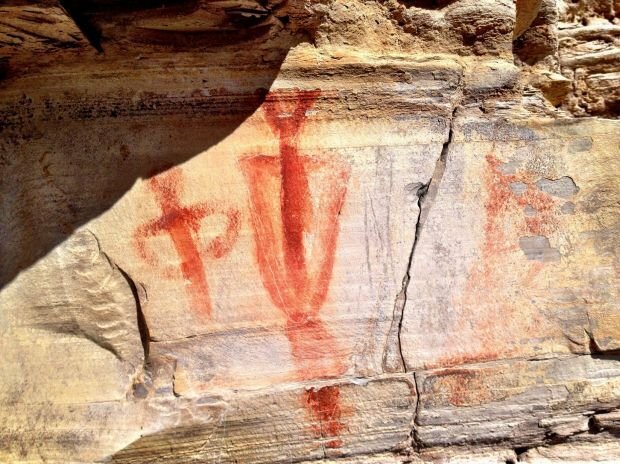 However, it wasn't until the ranch had been in her family for 70 years that Ahlgren came to understand the full importance of the pictographs. In 1989, John and Mavis Greer, Casper Wyo.-based archaeologists who specialize in rock art, came to see the pictographs. "They heard about the site, but they had not been to it because somebody told them my dad was an old grouch," Ahlgren said. When the Greers finally came to see the site, they were blown away. "We got over there, and they were just speechless," Ahlgren said. "John said, 'I don't think she knows what she's got here.'" It turns out that Ahlgren had the largest known collection of plains Indian rock art, in terms of quantity. She had no idea. After all, she figured pictographs could be found all over Montana. "He said, 'the first thing you have to do is preserve this site,'" she said. There's no other place like it, and it can't be replaced, John Greer told Ahlgren. The Bear Gulch site has somewhere between 4,000 and 5,000 individual pictographs and petroglyphs. Some of the drawings and etchings are as large as a dinner plate, while others are smaller. "The smallest one, the end of the cap of your pen, would cover the shield," Ahlgren said. Most of the drawings and etchings at Bear Gulch date from between A.D. 1000 to 1850. "Some of this rock art dates back pre-bow and arrow," she said. The pictographs and petroglyphs at Bear Gulch depict mainly shield-bearing warriors — human figures carrying large round shields that cover most of their bodies. Many pictograph sites record war stories or were a place for people to count coups. Bear Gulch has no depictions of war and few depictions of death. "We don't have any horses or guns," Ahlgren said. Some theories say the site was a place where Native Americans came after a vision quest. During the vision quest they would have found a spirit helper and would have gotten a vision for a shield design. Then they may have come to the rock wall at Bear Gulch to record that design. "There are a lot of theories," Ahlgren said. "There's no documentation. Everything we know is word of mouth." The site does have a distinct echo, which likely was what gave it additional importance as a spiritual place. Ahlgren would like to look for the location that might have been used as a vision quest site, but it's hard to know where to begin looking. "Who knows how far they went to do their vision quest," she said. In 2005, a group of archaeologists, organized by the Oregon Archaeological Society, came to Bear Gulch to record the pictographs and petroglyphs. The recording took about two weeks and involved covering each drawing with a piece of clear vinyl, so the drawing could be traced. The vinyl tracings are archived at the BLM office in Billings. "They'll be treated with white gloves and preserved forever," Ahlgren said. The rock wall at Bear Gulch is about a half mile long and about 100 feet high. The wall is made of many layers, creating surfaces large and small. "There's one on almost every surface," Ahlgren said. When the team of archaeologists arrived at Bear Gulch to do the recordings, the first thing they did was put a piece of blue masking tape next to each drawing. Although Ahlgren had been looking at the rock wall all her life, she was amazed to see how many pieces of tape there were. "Unless somebody points it out, you don't realize there's five drawings on top of each other," she said. The results of the recording were compiled into a book called "Fraternity of War," published by the Oregon Archaeological Society Press, which describes each of the drawings and give other information on Bear Gulch and Atherton Canyon, another pictograph site nearby. Ahlgren, along with the Greers, are working on another book about Bear Gulch and the Oregon Archaeological Society Press recently released a book on shield-bearing warrior rock art that includes Bear Gulch. In 2007, another team of archaeologists came to Bear Gulch for an archaeological dig. Ahead of the dig, archaeologists used ground-penetrating radar to look for anomalies underground. They found numerous anomalies, or places the ground had been disturbed. Many of those turned out to be fire pits. They also found some artifacts, which included some bone tools and one mussel shell tool, but no arrowheads. One of the fire pits had bison vertebrae in it, left over from a roast. The evidence found in the 10-day dig bolsters the theory that the site was used after vision quests. It appeared to be used for shorter periods of time by small groups. In addition to the prehistoric rock art, Bear Gulch is also home to historic graffiti, dating back to 1885. A wagon trail once ran by the rock wall, and passengers likely stopped to carve their name in the rocks. Ahlgren hopes to record all the historic graffiti in a similar fashion as was done with the prehistoric rock art. "One thing that's going to be neat about doing these historic graffiti recordings is I know all these people," she said. Many of the people who wrote their names on the wall have relatives who still live in the Forest Grove area. Ahlgren's grandfather carved his name on the wall in 1923. Ahlgren carved her own name nearby as a rite of passage after graduating high school. Her mother cracked down on name carving in the mid-'70s. Now Ahlgren only allows people to visit the site if they're on a guided tour so that the site won't be vandalized. "We don't allow people to go over there without us," she said. Last year about 1,000 people visited Bear Gulch. "It just seems like every year we get more and more people," Ahlgren said. Bear Gulch has been in Ahlgren's family since 1919 when her grandfather bought the ranch it sits on. Her family has worked to protect and preserve the rock art, while also making it accessible to the public. "It's at the point where it's going to be tough for us to keep up with it," Ahlgren said. Eventually, she'd like to set up a campground nearby and possibly have volunteers to help with reservations and maintenance. Some day she may sell it to a government entity so it can became public land, but only if the rock art and the surrounding site is sure to be preserved in its totality.